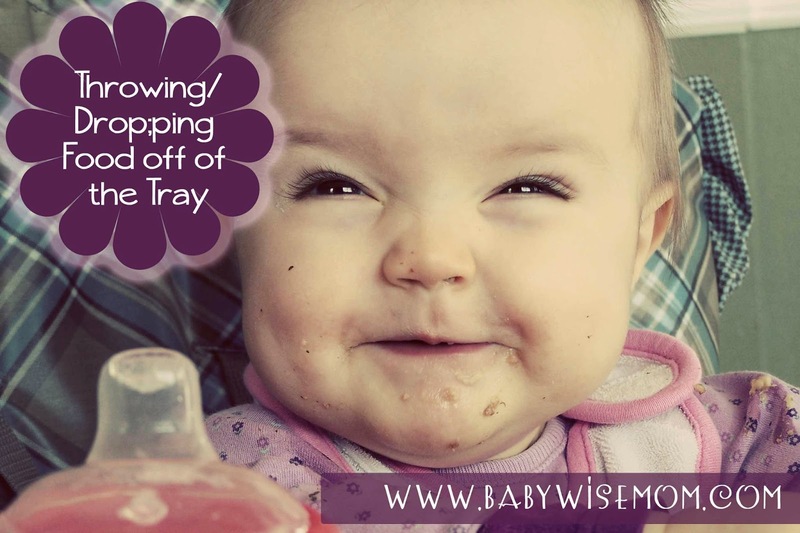 How to stop your baby from throwing or dropping food off of her tray. Intentionally throwing food off of the tray is not something I ever experienced with Brayden. Sure, food fell off the tray while he was eating sometimes, but he never intentionally threw it off. Then Kaitlyn came along. She is such an easy baby in so many ways, but she does have her vices. One of those is dropping food off her tray. I wasn’t sure she was doing it on purpose at first, but after some observation, I came to realize she was. She doesn’t do it immediately; she signs and says “all done” first, but if I don’t respond fast enough and she is feeling impatient, she starts to throw her food on the floor. I am pretty sure she has learned that I quickly respond when she throws her food. The problem here is that with two kids, I can’t always immediately respond to the desires of one, so when she is done, I can’t always get her out right away. Another problem I have is that she is trying to get my attention in the appropriate and polite way first, then moving on to other means. My personal solution for this mostly lies with myself. I have made more of an effort to respond to her as soon as she asks in her appropriate way. If I can’t get to her right away, I at least look at her and tell her I will be there in one minute. She is less prone to throw food if I at least acknowledge her. If she announces that she is all done but I want her to stay in her highchair for a bit longer for whatever reason, I will immediately remove her food from her so she can’t resort to dropping her food off her tray if she gets impatient. But maybe your child is throwing/dropping without using better means of communication first. If that is the case, I would use the firm voice, “that’s a no,” ‘mommy glare,’ and then take the food away and tell her she can get out when she signs or says all done, not by throwing her food. If your child is old enough to be sitting and eating finger foods, then she is most likely old enough to communicate in some way that she is done (other than throwing food). The first couple of meals, I would take her hands and physically sign all done for her and also say it. I would then tell her good girl and get her out. After a few times (based on age and ability), have her do it herself. When she does it, praise her for being a good girl and obeying, etc. If you are sure your baby just can’t communicate that yet, then I would say you need to watch more closely for other cues. You want to catch her before she gets to the food-throwing point. Get her out before that point. Before you get her out, ask if she is all done and sign it to her and/or for her. What you don’t want to do is have baby throw food because she wants out and you then immediately get her out. That is reinforcing the wrong behavior. That is the reason I suggest you remove the food, then have her sit and ask nicely. 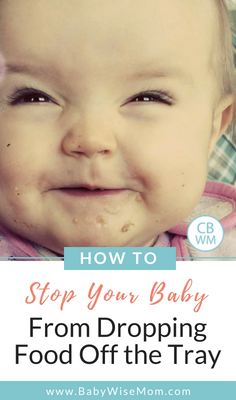 If your baby is throwing food just randomly throughout the meal, then you can take the food away immediately and wait for 30 seconds to a minute. Then give it back to her and tell her she can have her food but may not throw it. At some point (up to you) you would take it away for good. You could also take her out of the highchair and tell her she can go back if she will not throw her food. Don’t underestimate the comprehension ability of your children. They understand much earlier than we realize, and much earlier than they can really show their comprehension. Previous Post Poll Results: What age did you introduce solids? I just found your blog this weekend and am so excited! It’s great! Our son is almost 14 months old and we have done babywise from the beginning. He’s been great, and we are just encountering some things that I wanted your input on. He generally takes 2 naps a day, usually 1.5 hrs in the a.m. and then at least 2 hrs in the afternoon. Last week, he started screaming at naptime (he usually goes down quietly and wakes up happy). We found out that he had his first ear infection and I also think he is teething pretty bad right now. He’s doing good still at night, but just really struggling with naps. I know he doesn’t feel like himself totally, but he seems very clingy to me (this is also something he doesn’t do generally). A couple of times last week, I just let him sleep on me at naptime, but mostly, he cries and falls asleep. Which is so hard when I have never had to deal with it! He is going down for his naps better today and yesterday, but not sleeping very long and waking up fussing. I am just wondering, do you think I should change anything, or keep doing what I’ve always done? I don’t believe he’s at all ready to drop the morning nap. Is it your experience that bad teething/illness can make the child act more clingy/have separation issues? Sorry for the rambling post, this is our first baby and it’s just so hard to know what to do. This is really our first major disruption – we are so lucky!!! Thanks! My issue isn’t with throwing/dropping food YET since my daughter is only 8 months and not yet feeding herself. Our issue is that when she is full she closes her eyes very tightly, her tongue goes out, and spits. So cute at first….not so cute now. 🙂 I’ve been doing the “all done” sign for months now and she hasn’t begun to do it herself yet. So…??? Any suggestions? lol Denise! Those moments creep up constantly. Heather, I would suggest much of the same. I would tell her that’s a no, ask her if she is done, then sign all done to her. I would be firm with your tone of voice in telling her no. Consistency is going to get you there. Be sure to check out baby high chair manners linked in this post. I am LOVING your blogs!! They are always EXTREMELY helpful! I enjoy reading other moms too. My daughter is 9 1/2 months and has learned “more” but I don’t think she knows what it means yet…We are atruggling with her 7pm bottle feeding. We have feed her 8 ounces at 7pm and she goes to bed. For about 2 months now, that feeding is so bizarre. She doesn’t want much to eat, maybe 3-4 ounces and just wants to play. She rarely gets snacks so I know it isn’t because she is full. Her dinner is at 3:30. So I feel she has to be hungry. What we have been doing is walking around the house feeding her and she sits still long enough to eat. Doesn’t that sound weird. She is usually a good eater and seems overall happy. Any suggestions? thank goodness we don’t have too much of a problem with food throwing. but occasionally it does happen. my dd isn’t consistant with signing all done, but does sign, please, thank you and more, so i can say that that part of communicating is very helpful! thanks for the tips! You are welcome Julia! Thanks for the thanks! Lorna, I am glad the site is of use!This is what I did when Kaitlyn was that way. I removed the food from her tray and told her she needed to tell me all done to get down. Since she is doing it in order to get down, then I definitely wouldn't get her down when she does it.You can turn the high chair facing the wall and do a time out, or you can just tell her to sign all done.If you feel like she hasn't eaten enough, you can require her to take a couple more bites, but try to not stress about it too much. She won't let herself starve, and if you don't give her snacks later on after not eating well, then she will learn if she doesn't want to be hungry, she needs to eat when it is time. Good luck! My daughter didn't have a problem with dropping food off of her high chair–she HURLED it. She's got quite an arm too. She would totally fling it sideways. She started this pretty early, and the intent was not to throw food, make a mess, have fun, or be disobedient. When she was done eating, she wanted the food OFF her tray immediately. Like you, I had to start paying close attention to when she was done. All of this probably began when she was 10 or 11 months old. I hadn't had success teaching her to sign "all done," but she learned to sign more and to verbally say no, which really helped. Towards the end of the meal, I would ask her if she wanted more, and then I would only put one or two bites on her tray at a time. The bigger area of success for us has been teaching her to give her food to either of us when she's done eating. For about the past two or three months (she's now 15 months), I'll hear a very small "thank you" from her ("kay kou" is how it sounds), and she gives me her food. Here's how we trained her. When Isabelle throws a cracker, I tell her that it's a no no, lightly swat her hand, pick it up, and give it back to her. Then I say "give it to Mommy," with my hand out, and she happily obeys. We started this months ago, but she now consistently (95% of the time) gives it to me before throwing her food. It's a pretty good success rate for a 15 month old. Now that she's signing and saying "all done," it's getting even easier. I don't remove her from the high chair when she's done eating though because I want the family to eat together, and I think it's important that she has to stay in her chair until dinner is over. Thanks for adding your experience Gabrielle! Thank you so much for this blog. It is SO helpful!My question is regarding my almost 10 mo old son. He has been doing finger foods for about 1 1/2 months now. He just got the pincer grasp going…BUT our issue is that he doesn't put the food in his mouth. He prefers to play with it or drop it to the floor and watch where it fell.Side note: My son LOVES to drop, throw and roll his toys. He does it ALL day long! He has been doing this for months and can entertain himself for a solid hour with this kind of play. So now he's tranfering this 'interest' to his eating.I know that he is not being defiant with his dropping of food, but I also know that I don't want this to be a habit.Another issue is that I have to introduce finger foods usually 1/2 way through his meal to keep his interest. He's a good eater and enjoys his baby solids, but I find that he just likes to be moving so much that he 'loses' interest in solids unless I present some finger foods (I help put some in his mouth, he drops some and then at the same time will begin to open his mouth again for spoonfuls of solids).Any ideas? Amanda, as for the dropping, I would give him things you are okay with dropping and not at mealtimes and encourage him to practice that play at those times but not allow him to drop food. He is smart enough to realize the difference and you will still be able to let him practice that dropping skill.I don't think it is a problem for him to have finger foods with his meals. It will help him learn how to feed himself. In Babywise Book Two it discusses when your baby throws food on the floor, 3 disciplining methods: 1. verbal no, 2. swat or hand squeeze and 3. take him/her out of the highchair and to the crib. My question is this (because throwing and dropping food from the highchair is a BIG problem for us): Do I need to take my daughter up to the crib or will the pack and play accomplish the same thing? How long should she be in "time out" before I bring her back to the high chair? I tried this today at lunch and she went crazy – crying and hysterics. When I brought her back to the highchair she couldn't calm back down. My LO is 12.5 months and this is our first attempt at the Babywise method to work on our highchair problem. Thanks! !